A hilarious new middle-grade novel from beloved and best-selling author Gordan Korman about what happens when the worst class of kids in school is paired with the worst teacher - perfect for fans of Ms. Bixby’s Last Day. The Unteachables are a notorious class of misfits, delinquents, and academic train wrecks. Like Aldo, with anger-management issues; Parker, who can’t read; Kiana, who doesn’t even belong in the class - or any class; and Elaine (rhymes with pain). The Unteachables have been removed from the student body and isolated in room 117. Their teacher is Mr. Zachary Kermit, the most burned-out teacher in all of Greenwich. He was once a rising star, but his career was shattered by a cheating scandal that still haunts him. After years of phoning it in, he is finally one year away from early retirement. But the superintendent has his own plans to torpedo that idea - and it involves assigning Mr. Kermit to the Unteachables. Everyone who has ever been in a school w I ll appreciate this story, from veteran teachers, eager new teachers, students who struggle or not. I haven't enjoyed a book this much in a long time! And, the multiple narrators made it a true joy to listen to! Loved this story. About second chances and looking past the surface. Humorous and heartwarming at the same time. I wholeheartedly recommend it. Good characters, good story line, not boring, nice and clean, and good narration! Love this author and his stories! Will definitely listen to more! One of his best so far! Very entertaining and worth the credit. My kids loved it as well. 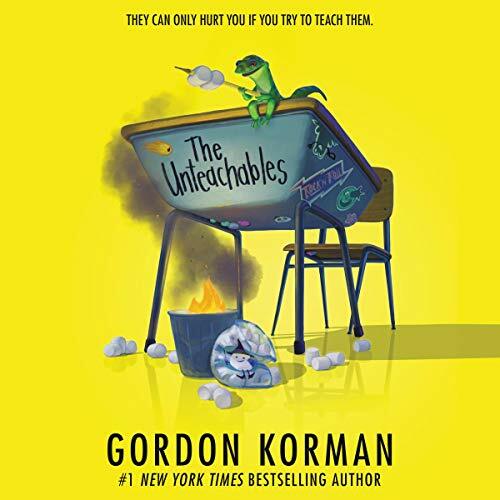 If have read Gordon Korman in the past and enjoyed it, The Unteachables will not disappoint you. A good teacher gone to seed. A class of misfits the system has given up on. While you might guess how the story is generally going to unfold, it was an absolute pleasure listening to the multiple narrators tell their story of a year in the Unteachables. The protagonist arguably is Kiana, only registering at the school for a few weeks while her mum is away working, and due to her stepmother's preoccupation with a baby, finds herself in a 'special class' with only six other students. But the seven students in his class - with anger issues, bad attitudes, the inability to read - they may still have something to teach themselves. Multiple actors voice the roles of the children and adults who share the story, making it very clear who is speaking. I loved the structure, hearing everyone's own take on the class and how gradually they all start to affect each other. It's an ideal novel to listen to, first person with lots of voices that are easily identifiable and an easy-to-follow story. The oft-utilised 'problem child' scenario is very nicely developed with several different issues experienced by the Unteachables cast, each humanised and shown to be someone who needs the right help, the right guidance... and just maybe so does their teacher. Mr Kermit is made very sympathetic, and the story manages to fit in without issue an arc for each major character, bringing in business from years past. Readers will be cheering by the end (I was smiling broadly) and warmed. No issues with language or violence, no mature themes, this is perfect material for ages 9-14.